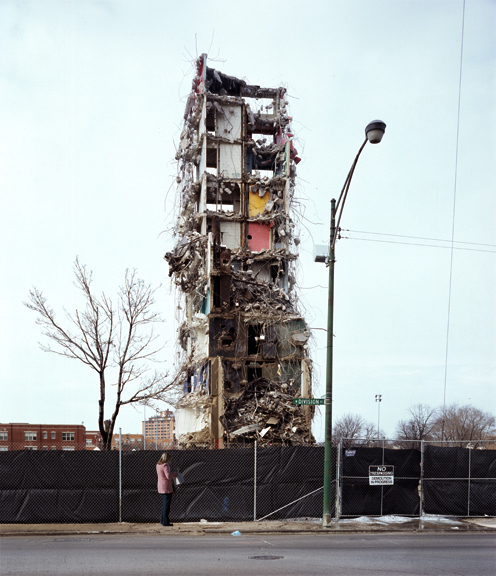 [Image: The old tower blocks of Chicago's Cabrini-Green, transformed by demolition into totem pole-like wind instruments, flute-ruins, a musically-active wasteland whistling to itself behind security fences. Photographer unknown; spotted at Archinect. It seems worth briefly pointing out, however, that Cabrini-Green could instead have been architecturally salvaged and later reused—and, given a different economic model, the towers could also have been refurbished. Indeed, through that latter link we learn that the combined weight of London's existing tower blocks is an astonishing forty million tons—meaning that high-rise building materials constitute a near-geological presence in many cities, and they should not simply go to waste...]. Would this be an example of Albert Speer's ruin value concept? Or does the building need to fall on on its own? Wow, Andrew - amazing first shot. Amazing second shot, too. Was that down near the airport? I don't remember that demolition. Excellent point, Geoff, that the building c/should have been salvaged. Thanks for the mention and the related links. Actually do you know of more: mass-reuse of materials? Anyone else, out there, have any such interesting related links? Urban Renewal ... as a new industry in/of itself (not just individual isolated projects) is the focus of my research/design work. This is should/must and will be the next major industry, I believe. Think about it: in an urbanized society, cities are where the many eco/social problems ... and their solutions are to be found. Truly enormous potential. Something people don't foresee in the same sense as in the years just before the introduction of the automobile (and it's mass acceptance). Think about how the world can 'be' changed for the better ... by design! Architect John Ronan once proposed turning Chicago's old main post office into a cemetery. It's quite brilliant in that a monolithic concrete structure may have a greater positive environmental impact than, say, an entire field of green roofs in the Loop. Well, actually, I can't scientifically validate that last statement, but it's what I suspect. And if one consider that cemeteries are a multi-billion dollar industry, I'd say it's quite an innovative strategy for urban renewal. In Vietnam partially deconstructed buildings - usually due to road widening - are left semi-intact and occupied - a sort of cross-section through life. See http://www.teeandcee.com/and/archives/69 for a single example, but there are entire highways of partially demolished houses still occupied.
) with much smaller-scale buildings, trees, and lots of small fractural elements designed, I think, to express liveliness rather than monumentality, a major swing to the Jane Jacobs end of the spectrum. ). For a lego fanatic, /that/ was how a city was /supposed/ to look. It took me a long time to realize that Hughes was not a fan of the plans he was showing on the screen and to come around to his opinion, but can the inner 11-year-old lego urban planner always remain suppressed? nigel - no idea. I'm not even sure the ruins are still standing, but if you drive around a bit I'm sure you'll see them or something similar. I wouldn't be too nervous about walking around, either - but that's just me. If a recording works out as planned, let me know!